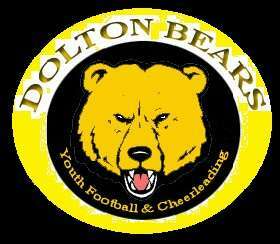 WELCOME TO THE 2016 SEASON OF THE DOLTON BEARS YOUTH FOOTBALL & CHEERLEADING PROGRAM. 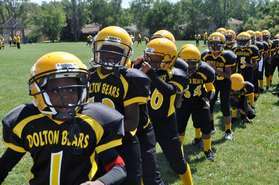 REGISTRATION FOR THE DOLTON BEARS PROGRAM IS ON-LINE. 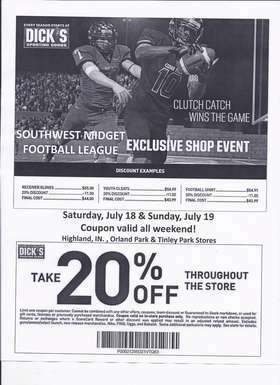 THE PROGRAMS REGISTRATION FEE IS $260.00 FOR FOOTBALL AND $325.00 FOR CHEERLEADERS. EARLY REGISTRATION JANUARY 23RD THRU MARCH 31ST. PARENTS REGISTERING MORE THAN ONE CHILD NEEDS TO PAY 55% OF TOTAL BALANCE UP FRONT AND PAY THE REMAINING BALANCE BY MARCH 31ST OR THE $ 40.00 WILL BE APPLIED TO BALANCE AND MUST BE DUE BY WIEGH IN. (TBD) NO MULTIPLE CHILD DISCOUNT!! PARENTS REGISTERING ONE CHILD MUST PAY $220.00 IN FULL TO TAKE ADVANTAGE OF EARLY REGISTRATION. THE SEASON STARTS WITH THE FIRST DAY OF REGULAR SEASON PRACTICE ON MONDAY AUGUST 01, 2016 PRACTICES WILL BE HELD AT DOLTON PARK FROM 5:30PM UNTIL 7:30PM MONDAY THRU FRIDAY, FOR THE 1ST 3 WEEKS, AFTER AUGUST PRACTICE WILL BE HELD ON TUESDAY, THURSDAY, & FRIDAY FROM 5:30PM UNTIL 7:30PM UNTIL THE SEASON ENDS. TWO COMPETITIONS, CAMP, PRACTICE GEAR & TEAM ACCESSORY PACKAGE EXAMPLE.... SHOES, SOCK, HAIR BOWS, HOMECOMING AND PEP RALLY GEAR, COMPETITION GEAR, PARTY AND END OF THE YEAR CELERATION. FOOTBALL HELMET, HELMET MOUTHPIECE, FOOTBALL SHOULDER PADS, & GAME JERSEY. THESE ITEMS MUST BE RETURNED AT THE END OF THE SEASON, EXCEPT THE MOUTHPIECE!!!! SECONDARY INSURANCE FOR ALL PARTICIPANTS, REFEREE GAME FEES, ALONG WITH PRACTICE & GAME EQUIPMENT COSTS. THE FIRST REGULAR SEASON GAMES ON SATURDAY AUGUST 27TH & THE SEASON RUNS TO MID NOVEMBER. THE SOUTHWEST LEAGUE WEIGH INS ARE HELD TWICE DURING THE SEASON & ALL FOOTBALL PARTICIPANTS MUST ATTEND & BE WEIGHED IN BY THE LEAGUE OFFICIALS. & THERE WILL BE NO REGISTRATION FEES REFUNDED. WE LOOK FORWARD TO A GREAT SEASON IN 2016 & WELCOME ALL POSITIVE FEEDBACK, AS WELL AS ANY & ALL ASSISTANCE FROM PARENTS. To to remain on file with the Dolton Bears Organization. While promoting self confidence, good sportsmanship, camaraderie, physical, and mental development. The Widget level focuses on early development.